For the first time the PM’s XIII’s match will see a double header of matches to be played by both PNG and Australia’s men and women’s side on Saturday. Australian PM’s XIII coach Mal Meninga said this is an extra-ordinary step forward and they have been working very hard behind the scenes with the Australian PM’s XIII woman’s side who will be playing with PNG woman’s side for the first ever-international match. Meninga said that this will be a real momentous time for rugby league in general adding that it will be a great spectacle. 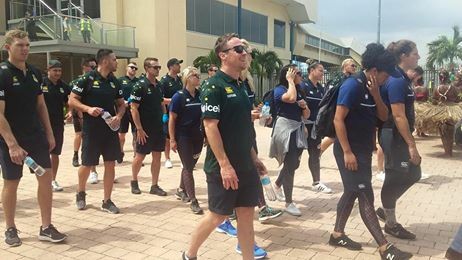 Also this afternoon the visiting Australian PM’s XIII side and the Women’s rugby league World Champions Jillaroos arrived at the Jacksons International Airport for their match on Saturday.